Did Alien Life Evolve Just After the Big Bang? 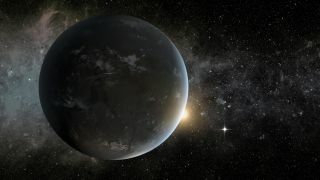 Artist's impression of Kepler-62f, a potential super-Earth in its star's habitable zone. Traditionally, astrobiologists keen on solving the mystery of the origin of life in the universe look for planets in habitable zones around stars. Also known as Goldilocks zones, these regions are considered to be just the right distance away from stars for liquid water, a pre-requisite for life as we know it, to exist. For comparison, the earliest evidence of life on Earth dates from 3.8 billion years ago, about 700 million years after our planet formed. A 2013 map of the background radiation left over from the Big Bang, taken by the ESA's Planck spacecraft, captured the oldest light in the universe. This information helps astronomers determine the age of the universe. Just after the Big Bang, the cosmos was a much hotter place. It was filled with sizzling plasma — superheated gas — that gradually cooled. The first light produced by this plasma is the cosmic microwave background radiation (CMB) that we observe today, which dates from about 389,000 years after the Big Bang. Now the CMB is freezing cold — around minus 454 degrees Fahrenheit (minus 270 degrees Celsius; 3 Kelvin). It cooled down gradually with the expansion of the universe, and at some point during the cooling process, for a brief period of seven million years or so, the temperature was just right for life to form — between 31 and 211 degrees Fahrenheit (0 and 100 degrees Celsius; 273 and 373 Kelvin). It is the CMB's heat that would have allowed water to remain liquid on ancient exoplanets, Loeb said. But the question is whether planets — and especially rocky planets — could already have formed at that early epoch. According to the standard cosmological model, the very first stars started to form out of hydrogen and helium tens of millions of years after the Big Bang. No heavy elements, which are necessary for planet formation, were around yet. These first planets would have been bathed in the warm CMB radiation, and thus, Loeb argues, it would have been possible for them to have liquid water on their surface for several million years. Loeb says that one way to test his theory is by searching in our Milky Way galaxy for planets around stars with almost no heavy elements. Such stars would be the nearby analogues of the early planets in the nascent universe. Based on his findings, Loeb also challenges the idea in cosmology known as the anthropic principle. This concept attempts to explain the values of fundamental parameters by arguing that humans could not have existed in a universe where these parameters were any different than they are. So while there might be many regions in a bigger "multiverse" where the values of these parameters vary, intelligent beings are supposed to exist only in a universe like ours, where these values are exquisitely tuned for life. For instance, Albert Einstein identified a fundamental parameter, dubbed the cosmological constant, in his theory of gravity. This constant is now thought to account for the accelerating expansion of the universe. Also known as dark energy, this constant can be interpreted as the energy density of the vacuum, one of the fundamental parameters of our universe. Anthropic reasoning suggests that there might be different values for this parameter in different regions of the multiverse — but our universe has been set up with just the right cosmological constant to allow our existence and to enable us to observe the cosmos around us. Loeb disagrees. He says that life could have emerged in the early universe even if the cosmological constant was a million times bigger than observed, adding that "the anthropic argument has a problem in explaining the observed value of the cosmological constant." An artist's representation of the 'habitable zone,' the range of orbits around a star where liquid water may exist on the surface of a planet. A new study unveiled Nov. 4, 2013 suggests one in five sunlike stars seen by NASA's Kepler spacecraft has potentially habitable Earth-size planets. Edwin Turner, a professor of astrophysical sciences at Princeton University, who was not involved in the new study, called the research "very original, stimulating and thought-provoking." Astrophysicist Joshua Winn of the Massachusetts Institute of Technology, who did not take part in the study either, agrees. "In our field, it has become traditional to adopt a definition of a 'potentially habitable' planet as one that has a solid surface and a surface temperature conducive to liquid water,” he said. "Many, many papers have been written about the exact conditions under which we might find such planets — what type of interior composition, atmosphere, and stellar radiation field. Avi has taken this point to a logical extreme, by pointing out that if those two conditions are really the only important conditions, then there is another way to achieve them, which is to make use of the cosmic microwave background."